Local authorities are planning to charge five organizers of the 68th Karen Martyrs’ Day event under the Ward and Village Tract Administration Law for holding the commemoration without permission at the Kayin People’s Party (KPP) office in Hinthada Township, Irrawaddy Region on August 12. Hinthada District Administrator U Myo Aung said he prohibited the Karen Martyrs’ Day commemoration, but it was held successfully. The authorities summoned the five organizers to Hinthada Township Office on August 13 and started making arrangements to file charges against them. “When they submitted the permit for the ceremony, they only submitted that they would hold an award ceremony for outstanding students and a wrist-tying ceremony. Since they held the Martyrs’ Day ceremony, it wasn’t submitted in accordance with Section 21 of the Ward and Village Tract [Administration] Law. So, we are going to charge them under Section 21. As this is under the Ward and Village Tract [Administration] Law, the village administrator has to submit the case directly to the court,” U Myo Aung told Karen News. The regional government has banned the Karen Martyrs’ Day commemoration and local authorities only allowed Karen traditional wrist-tying ceremony and award ceremony for outstanding students in line with the instruction from the regional government. 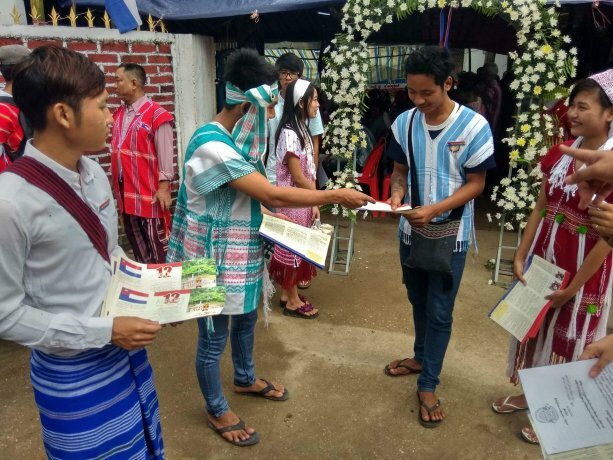 A notification letter arrived on August 12 to take action against the organizers – the Kayin People’s Party chair Saw Kyaw Gyi, Saw Than Tun Than, Saw Khu Shee Htoo, Saw Aung Mon Soe, and Padoh Mahn Nyein Maung, head of the Karen National Union (KNU)’s Alliance Affairs Department and member of the Central Executive Committee. Hinthada Township Kayin People’s Party chair Saw Kyaw Gyi, one of the ceremony organizers, said they were summoned to the township administrative office at 9 am on August 13 and informed them about the plan to take action against them. “They only allowed wrist-tying ceremony and award ceremony. Plans are underway to take action against us under the order from the higher authorities for including unrelated ceremonies. No action has been taken up to today. We were summoned today to inform us about the plan,” he told Karen News. This was the third time the Karen Martyrs’ Day commemoration has been held in Hinthada Township and it was held together with the Karen traditional wrist-tying ceremony. The Karen Martyrs’ Day commemoration covered the singing of the Karen national song, saluting the Karen flag, saluting the fallen Karen martyrs including Saw Ba U Gyi, laying down wreaths by respective townships, and giving talks. The Karen Martyrs’ Day commemoration was also prohibited in Karen martyr Saw Ba U Gyi’s birthplace in Be Ga Yet Village of Kangyidaunt Township, Myaung Mya Township, and Pantanaw Township in the Irrwaddy Region. The organizers were pressured against holding the event in the Yangon Region.